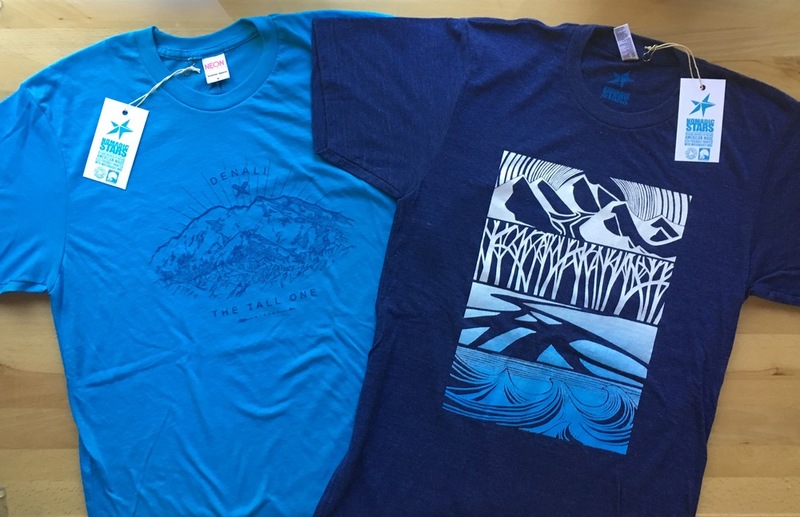 Nomadic Stars is one of only a few shops in Alaska to offer water-based screen printing and the first full scale eco-friendly screen print shop in Alaska. Most screen print companies use plastisol inks that contain PVC and pthalates that are harmful to the environment and have been linked to numerous medical disorders. Plastisol inks also require the use of harmful solvents in the cleaning process. Our inks do not contain ozone depleting chemicals, lead or any heavy metals. In fact, our inks do not contain any toxic chemicals at all! That makes us the safe choice for the environment, and clothing for people of all ages. We use several vendors for a wide variety of options. Sanmar carries several recognizable brands such as Hanes, and Gildan. They also carry some of their own lines including Port & Company and District Threads. If you are interested in American Made, American Apparel has a great variety of items in an assortment of colors. Please be aware that American Apparel's marketing is edgy, but their variety of garments and color selections are unparalleled. Image Apparel carries a wide arrange of industrial wear for business. Teamwork Athletic carries sports uniforms. Matman Wrestling carries wrestling equipment. For raster art (most commonly jpg, tif, gif, bmp, or psd files) we need the image to be 300 dpi or higher and the file must be the actual size you’d like it to be printed. Anything less might not be printable. For spot color we prefer printing from vector art (most commonly ai or eps files). All fonts must be converted to outlines/shapes. Standard turnaround time is 15 business days. We can accommodate rush orders to meet deadlines. Rush charges: In stock supply is $2 extra per garment. Garments that have to be ordered are $4 extra per garment. If you are ready to inquire about an order please send us a message through our Contact page or call us at 907-457-5132 and we will be happy to help you with getting your order started.